Seylan Bank offers upto 14 per cent interest on “Seylan Ihalin Ihalata”, a tier based Savings account, which offers a higher rate of interest for higher balances. The initial deposit to open a “Seylan Ihalin Ihalata” account is Rs. 5,000/-. Overnight balances between Rs. 5,000/- and Rs. 50,000/- attract an interest rate of 12.5 per cent p.a. and from Rs. 50,001/- onwards an interest rate of 14 per cent p.a. would be applicable. Interest would be calculated on the end-of-day balances at the applicable interest rate and credited to the account on a monthly basis. Customers could transact business as usual and any number of withdrawals are allowed. Those who maintain a minimum balance of Rs 20,000/- in their “Seylan Ihalin Ihalata” accounts, for a continuous unbroken period of six calendar months immediately preceding the event would be eligible to apply for “Seylan Merit Rewards” benefits, as well for grants covering life style benefits such as marriage, child birth, surgery, winning international events, etc. In addition, depositors would be issued with a Seylan VISA International Debit Card free of charge for the first year, free SMS Banking facility and free Internet Banking facility too would be on offer for the first year. ‘Seylan Ihalin Ihalata’ balances could be used as collateral for borrowings over the counter for upto 90 per cent of the account balance. Account holders also have the freedom to access their accounts from anywhere in the world with internet banking, telephone Banking, SMS banking and through the Visa Electron international debit card. Seylan Bank with its island-wide branch and ATM network and the ‘Anywhere, Anytime Banking’ concept has provided convenience to its customers, who could use their international debit card for purchases at any VISA accredited merchant, directly debiting their accounts. Seylan Bank’s customers can also enjoy 24 hour 365 day uninterrupted banking at Millennium branch, Ceylinco Seylan Towers, Galle Road, Colombo 03. As per its Founder Chairman Dr. Lalith Kotelawala’s initiative, Seylan Bank’s Savings Account holders can have banking brought to their doorstep with the ‘Palm Top Banking’ concept which, coupled with the above benefits, is an unbeatable combination, being the envy of other financial institutions. Internet Banking Officer, HSBC, Zarshad Farook, Assistant Manager Direct Banking, HSBC, Milinda Nandasena, Manager Product Development and Channel Marketing, HSBC Gayal Wickramasinghe handing over the list of winners to Deputy Commissioner G. A. N. Jayantha - and Tax Officer Samantha Abeywardena. HSBC concluded the monthly draw for its ‘Click and Win’ Personal Internet Banking usage promotion, which was introduced in June 2008. Twenty lucky HSBC Personal Internet Banking customers, were rewarded with valuable prizes, including pen drives and HSBC branded items. The ‘Click and Win’ promotion will continue to reward customers through a points scheme till August 31, increasing their chances of winning every time they use the service to perform various transactions. To enter the Monthly draw and the Grand Draw, customers will get one chance for every 10 points they have earned during the promotion period. The Click and Win usage promotion has resulted in a significant increase of customer usage of Personal Internet Banking during the months of June and July. Overall winners of the draw include: F. N. Akram, A. G. Dehigaspitiya, D. B. Pushpakumara, C. S. Avory, Y. M. N. K. Bandara, K. A. Wijegunasinghe, K. K. P. Nanayakkara, A. T. D. Thampapillai, H. D. J. B. Ranchigoda, M. Wijegunawardene, A. M. M. Mipas, S. Ranatunga, V. Kanthasamy, A. C. A. Irshad, W. C. de Silva, A. Riyaz, K. D. Bais, T. C. Athuraliya, W. W. M. L. Wijesundara and C. B. Wijethilake. 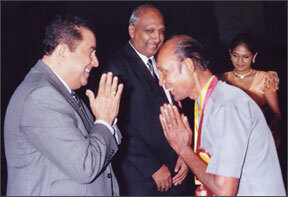 A member of the board of Directors Dr. Buddhadasa Kaluarachchi awarding a gold coin to an employee. 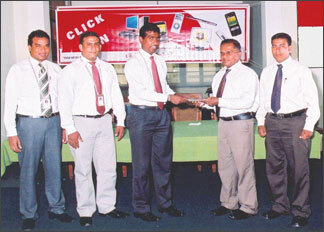 Bank of Ceylon celebrated its 69th Year Anniversary on 1st August 2008. As part of banks’ anniversary celebrations 580 employees who have completed 25 years of service were felicitated recently. The Board of Directors, General Manager and the Corporate Management presided over the event which was held on the August 16 at BMICH. Addressing the gathering the bank’s General Manager B. A. C. Fernando reiterated the fact that any organisations’ progress is dependent on its staff and he was proud to say that over the years Bank of Ceylon’s success was mainly due to its staff’s dedication and commitment. At present Bank of Ceylon has the widest branch network comprising 305 branches across the country and three overseas branches in London, Male and Chennai. With an asset base of over Rs. 450 billion and a customer base of over seven million BOC has the international AA Fitch rating. Today the BOC staff strength exceeds 8000 employees. Nations Trust Bank PLC recently opened their fifth Personal Banking Centre, located at the Keells Super outlet in Wattala. The Bank’s Personal Banking Centre (PBC) offers 365 day banking facilities through its ATM - which permits cash deposits that are recognised in real time, which means that the money that is deposited will be credited to the relevant account instantly. In addition to this the PBC also facilitates cash deposits, payments for the American Express card, a cheque drop box to make payments and deposits via cheques as well as a host of benefits through this automated service. Each PBC will also have key service personnel for any assistance or inquiries. Customers may also use the PBC to open savings and fixed deposit accounts as well as having free access to the Bank’s internet banking services. Chairman People’s Bank W. Karunajeewa, handing over the sponsorship cheque to Director General, Civil Security Department Rear Admiral Sarath P. Weerasekera. 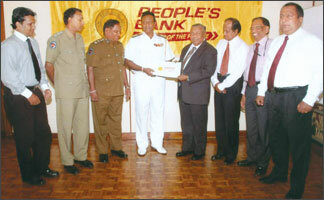 Also in the picture are Chief Executive Officer / General Manager M. Wickremasinghe, Head of Banking Services Kumar Mayadunne, Head of Marketing and Public Affairs from People’s Bank Deepal Abeysekera, Additional Director General Nandana Wijeratne, Headquarters CEO CI Jagath Wijesundera and District Officer Janaka Liayanaarachchi, Coordinator - Archaeological Activities from the Civil Security Force. People’s Bank has joined with the Civil Security Department, which is working under the guidance of the Archaeological Department, in a project to refurbish, beautify and to provide for the maintenance of the grounds in which the sacred Avukana Buddha statue is situated in. The project aims to restore the due glory to this place of worship, which is a symbol of spirituality and serenity to Sri Lanka. Yet another corporate social responsibility endeavour of People’s Bank, this project will protect this national treasure, preserving its moral, religious and cultural significance for generations to come.